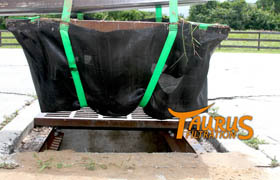 GEI Works' new Taurus Hopper Under Grate Filter fits securely beneath storm and catch basin grates for storm drain protection from trash, sediment, debris, mosquitos and flying insects. Street sweeper friendly, you'll be amazed with not only how easy this catch basin filter is to install, but with how much better and longer Taurus performs than the industry standard (known as "witch's hats") in filtering debris and controlling flying insects. Taurus storm drain filters are recommended stormwater BMPs, and can help keep your site in compliance with local and federal stormwater regulations as part of a SWPPP. Taurus storm drain and catch basin filters are made in the USA and are designed for durability and longevity. Questions? We can help! Call us at 1-772-646-0597 or contact us! The Taurus Hopper fits under the storm drain or catch basin grate, preventing trash and debris from entering waterways and filtering sediment before it enters the storm water system. The hopper (collection area) is larger than traditional comparable products, accommodating large amounts of silt, trash, debris and sand. Nylon webbing straps are featured for ultimate support and can withstand thousands of pounds of pressure. The (optional) high visibility design makes it easy to quickly identify which storm drains contain the under grate filter. Additionally, Taurus products can prevent mosquitoes from exiting storm drains for flying insect control. 1) Lift the grate using a lifting strap or other approved safety device. 2) Remove the filter from the grate. 3) Empty the filter hopper and dispose of the contents. 4) Reattach the filter to the grate per Installation Instructions. 5) Use lifting strap or other approved safety device to replace the grate in the drain opening. Looking for additional storm drain filters? GEI Works' line of Taurus filtration products provide significant cost savings due to their extended lifespan. Still not sure which storm drain protection product you need? We can help! Call our team at 1-772-646-0597, or request a quote. See federal NPDES regulations and information.